Microblading is a form of tattooing. Unlike a regular tattoo, “microblading is a form of tattoo artistry where pigment is implanted under your skin with a manual handheld tool instead of a machine. 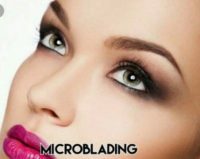 Microblading will allow you to have that natural fuller look to your eyebrows that you’ve always wanted without having to fill them in everyday with make-up.